The eyelids serve several valuable functions. Most importantly they provide mechanical protection to the globe. They also provide vital chemical elements to the precorneal tear film, and help distribute these layers evenly over the surface of the eye. During the blink phase the eyelids propel tears to the medial canthus where they enter the puncta of the lacrimal drainage system. The eyelashes along the lid margins sweep air-borne particles from in front of the eye, and the constant voluntary and reflex movements of the eyelids protect the cornea from injury and glare. In the young adult the interpalpebral fissure measures 10 to 11 mm in vertical height. In middle age this is reduced to only about 8 to 10 mm (1) and in old age the fissure may be only 6-8 mm or less. The horizontal length of the fissure is 30 to 31 mm. The upper and lower eyelids meet at an angle of approximately 60 degrees medially and laterally. In primary position of gaze the upper eyelid margin lies at the superior corneal limbus in children and 1.5 to 2.0 mm below it in the adult. The lower eyelid margin usually rests at the inferior corneal limbus or just slightly above it. The margin of each eyelid is about 2 mm thick. Posteriorly the marginal tarsal surface is covered with conjunctival epithelium, interrupted by the meibomian gland orifices (Fig. 1). Anteriorly the margin is covered with cutaneous epidermis from which emerge the eyelashes. The gray line is a faint linear zone separating these two regions. Between the skin and conjunctiva at a level 5 mm above the tarsus are, layered from front to back, the orbicularis muscle, the orbital septum, the preaponeurotic fat pockets, the levator aponeurosis, and Muller's supratarsal muscle. The skin covers the external surface of the body and provides significant protection against trauma, solar radiation, temperature extremes, and desiccation. It also allows for major interaction with the environment. The skin of the eyelid is the thinnest in the body owing to only a scant development of the dermis and subcutaneous fat. Figure 1 Sagittal cross-section of the upper eyelid. a. Orbicularis muscle; b. orbital septum; c. preaponeurotic fat pad; d. levator aponeurosis; e. tarsal plate; f. Muller's supratarsal muscle; g. conjunctiva. At the base of the sequence is the stratum basale (= basalis) containing cuboidal or columnar cells arranged in a single row and containing large nuclei (Fig. 3). The basal layer of columnar cells with mitotic figures serves for keratinocytic proliferation and was formerly referred to as the stratum germinativum. Together, the strata basale and germinativum are called the basal cells. The stratum spinosum is the next higher layer and is composed of polygonal cells which form spines when they shrink during histologic preparation because of the presence of desmo-somes between adjacent cells. The cytoplasm is filled with tonofilaments and phospholipids. The stratum granulosum is 3 to 5 cells thick; these cells contain keratohyalin granules rich in histidine and precursors of the protein filaggrin that promotes keratin filament aggregation. Toward the top of this layer the cells lose their nucleus and become more flattened. 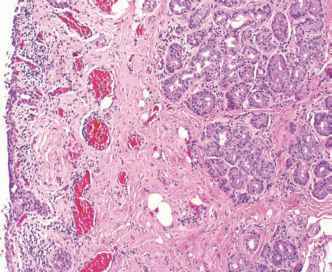 Changes in enzyme function cause cell death as the cells enter the upper-most layer, the stratum corneum. This layer is made of dead, flattened keratinocytes that shed about every few weeks in a process known as desquamation. This layer provides a waterproof covering that also resists minor abrasions. In thicker skin such as the palms and soles a layer called the stratum lucidum is found between the granular and cornified strata; this appears as a clear homogeneous amorphous zone. Figure 2 Anatomic section of eyelid skin showing major dermal adnexal structures. 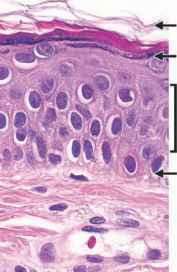 Figure 3 Histologic section of eyelid skin showing the four layers of the epidermis, and the dermis. are ultimately transferred to the keratinocytes where they accumulate on the sun-exposed side of the nucleus to protect it from UV radiation. Langerhans cells, or epidermal dendritic cells, are macrophages that originate in the bone marrow and migrate to the epidermis. They are present in all epidermal layers, but are concentrated in the stratum spinosum. They serve as antigen-presenting cells that ingest and process foreign antigens and present them to lymphocytes for activation of the immune system. The function of the Merkel cell is not completely understood. They are derived from neural crest cells and are attached to keratinocytes by desmosomes. They are found throughout the epidermis but are particularly abundant in the basal layer. Merkel cells are associated with nonmyelinated nerve endings with which they form the Merkel disc which may act as a mechanosensory receptor for light touch. Beneath the epidermis is the basement membrane and below that the dermis. The stratum basale is connected to the basement membrane by protein fibers. On the dermal side anchoring fibers of collagen tether the dermis to the basement membrane. The basal membrane is irregular and epidermal extensions project into the dermis to form a system of rete ridges. These are more prominent in areas where the skin undergoes shearing stress. The dermis lies beneath the basement membrane and on the eyelids is about 0.3 mm in thickness compared to other parts of the body where it may be up to 3 mm thick. It contains three types of tissues that are not layered: collagen, elastic tissue, and reticular fibers. The upper papillary dermal layer contains a thin arrangement of collagen fibers. The lower reticular dermal layer is thicker and contains thick collagen fibers arranged parallel to the surface. The reticular layer also contains fibroblasts, mast cells, nerve endings, lymphatics, and epidermal appendages surrounded by a ground substance of mucopolysaccharides, chondroitin sulfates, and glycoproteins. The fibroblast is the major cell type in the dermis. These secrete elastin and a procollagen that is then cleaved by proteolytic enzymes into collagen which becomes cross-linked. 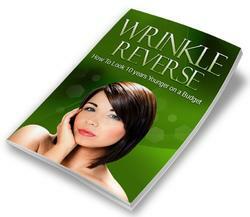 Collagen makes up nearly 70% of the dermis by weight. A number of epidermal appendages lined with epithelium lie within the dermis. These include hair follicles associated with an arrectopili muscle attached to the dermal-epidermal junction. 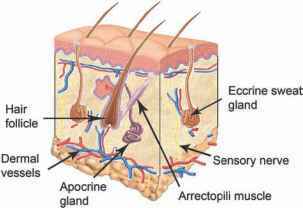 Apocrine sweat glands of Moll are coiled glands in the deep dermis that empty via a long ductule into the uppermost portion of the hair follicle. Apocrine glands secrete by cellular decapitation with the apical portion of the secretory cell mixed with sialomucin producing a more viscous secretion with cellular debris. They are concentrated along the eyelid margins. Figure 4 Histologic section of the conjunctiva with numerous glands of Wolfring. the follicle. The hair follicle along with the sebaceous and Moll glands form the pilosebaceous unit. Additional small sebaceous glands called glands of Zeis are present between follicles and discharge their contents directly onto the skin surface. Eccrine sweat glands are also present in the dermis but they are not associated with the hair follicle. They open directly onto the epidermal surface via a long straight ductule. Eccrine glands secrete a clear fluid composed of water, salts, glycogen, and sialomucin. Blood vessels and nerve endings course throughout the dermis where they derive from similar structures in the sub-dermis and deep fascia. Specialized sensory structures called Meissner's and Vater-Pacini corpuscles within the dermis transmit sensations for touch and pressure. Beneath the dermis is a subcutaneous layer of fat and connective tissue. Subcutaneous fat is very sparse beneath the preseptal portion of the eyelid skin, and absent from the more distal pretarsal portions. Beneath the skin within the eyelid are also found other structures that can be the focus for disease processes. On the subconjunctival side of the eyelid these accessory structures include the accessory lacrimal glands of Krause and Wolfring beneath the conjunctiva and are concentrated on the lateral side (Fig. 4), and the meibomian glands which are modified sebaceous glands within the tarsal plates (Fig. 1). The orbicularis oculi is a complex striated muscle that lies just below the skin. It is divided anatomically into three contiguous parts—the orbital, preseptal, and pretarsal portions (Fig. 5). The orbital portion overlies the bony orbital rims. It arises from insertions on the frontal process of the maxillary bone, the orbital process of the frontal bone, and from the common medial canthal tendon. Its fibers pass around the orbital rim to form a continuous ellipse without interruption at the lateral palpebral commissure, and insert just below their points of origin. The palpebral portion of the orbicularis muscle overlies the mobile eyelid from the orbital rims to the eyelid margins. The muscle fibers sweep circumferentially around each lid as a half ellipse, fixed medially and laterally at the canthal tendons. Although this portion forms a single anatomic unit in each eyelid, it is customarily further divided topographically into two parts, the preseptal and pretarsal orbicularis. Figure 5 Orbicularis and frontalis muscles. a. Pretarsal portion; b. preseptal portion; c. orbital portion; d. frontalis muscle. Figure 6 The orbital septum originating from the arcus marginalis of the orbital rim. insert onto the lateral canthal tendon and raphe. Contraction of these fibers aids in the lacrimal pump mechanism (2). Medially the deep heads of the pretarsal fibers fuse to form a prominent bundle of fibers, Horner's muscle, that runs just behind the posterior limb of the canthal tendon. It inserts onto the posterior lacrimal crest. Horner's muscle helps maintain the posterior position of the canthal angle, tightens the eyelids against the globe during eyelid closure, and may aid in the lacrimal pump mechanism (3). The orbital septum is a thin fibrous multilayered membrane anatomically beginning at the arcus marginalis along the orbital rim and represents a continuation of the orbital fascial system. Distal fibers of the orbital septum merge into the anterior surface of the levator aponeurosis (Fig. 6) (4,5). The point of insertion is usually about 3 to 5 mm above the tarsal plate, but may be as much as 10 to 15 mm (6). In the lower eyelid the septum fuses with the capsulopalpebral fascia several millimeters below the tarsus, and the common fascial sheet inserts onto the inferior tarsal edge (7,8). The septum can always be identified at surgery by pulling it distally and noting firm resistance against its bony attachments. Immediately behind the septum are yellow fat pockets that lie immediately anterior to the levator aponeurosis in the upper lid and the capsulopalpe-bral fascia in the lower lid. This anatomic relationship is important to note since identification of the levator aponeurosis or capsulopalpebral is critical in many eyelid surgical procedures. The preaponeurotic fat pockets in the upper eyelid and the pre-capsulopalpebral fat pockets in the lower eyelid are anterior extensions of extraconal orbital fat. These eyelid fat pockets are surgically important landmarks and help identify a plane immediately anterior to the major eyelid retractors. In the upper eyelid there are typically two fat pockets, a medial pocket, and a central one. Laterally, the lacrimal gland may be mistaken for a third fat pocket. In the lower eyelid there are three pockets, medial, central, and lateral. Figure 7 Anterior orbital fascial system. a. Whitnall's ligament; b. levator aponeurosis; c. medial canthal tendon; d. lateral canthal tendon. annulus of Zinn. The muscle runs forward in the superior orbit just above the superior rectus muscle. Near the superior orbital rim a condensation is seen along the muscle sheath (9), that attaches medially and laterally to the orbital walls and soft tissues. This is the superior transverse orbital ligament of Whitnall. Its exact role remains a matter of controversy, but it appears to provide some support for the fascial system that maintains spatial relationships between a variety of anatomic structures in the superior orbit. From Whitnall's ligament the muscle passes into its aponeurosis (Fig. 7). This sheet continues downward 14 to 20 mm to its insertion near the marginal tarsal border. The aponeurotic fibers are most firmly attached at about 3 to 4 mm above the eyelid margin (10,11). Beginning near the upper edge of tarsus, the aponeurosis also sends numerous delicate interconnecting slips forward and downward to insert onto the interfascicular septa of the pretarsal orbicularis muscle and subcutaneous tissue. These multilayered slips maintain the close approximation of the skin, muscle, aponeurosis, and tarsal lamellae, thus integrating the distal eyelid as a single functional unit. This relationship defines the upper eyelid crease of the western eyelid. As the levator aponeurosis passes into the eyelid from Whitnall's ligament it broadens to form the medial and lateral "horns." The lateral horn forms a prominent fibrous sheet that indents the posterior aspect of the lacrimal gland, defining its orbital and palpebral lobes. It inserts through numerous slips onto the lateral orbital tubercle of the zygomatic bone, at the lateral retinaculum. The medial horn is less well developed. It blends with the intermediate layer of the orbital septum and inserts onto the posterior crus of the medial canthal tendon and the posterior lacrimal crest. Together, the two horns serve to distribute the forces of the levator muscle along the aponeurosis and the tarsal plate. In the lower eyelid the capsulopalpebral fascia is a fibrous sheet arising from Lockwood's ligament and the sheaths around the inferior rectus and inferior oblique muscles. It passes upward and generally fuses with fibers of the orbital septum about 4 to 5 mm below the tarsal plate. From this junction a common fascial sheet continues upward and inserts onto the lower border of tarsus. Fine fibrous slips pass forward from this fascial sheet to the orbicularis intermuscular septae and subcutaneous tissue, forming the lower eyelid crease and uniting the anterior and posterior lamellae into a single functional unit. sympathetic muscle is less well defined. 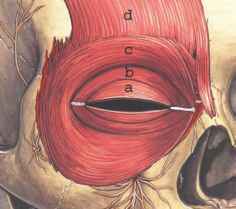 Fibers run behind the capsulopalpebral fascia to insert onto the lower border of tarsus, although they may end 2 to 5mm below tarsus (14). Disruption of sympathetic innervation to these muscles results in Horner's syndrome. This is characterized by the classic triad of ptosis, miosis, and ipsilateral anhidrosis of the face. Specific clinical findings vary according to the location of the lesion along the polysynaptic pathway. The upper eyelid ptosis and elevation of the lower eyelid result from loss of sympathetic smooth muscle tone and accessory retraction. The tarsal plates consist of dense fibrous tissue approximately 1 to 1.5 mm thick that give structural integrity to the eyelids. Each measures about 25 mm in horizontal length, and is gently curved to conform to the contour of the anterior globe. The central vertical height of the tarsal plate is 8 to 12 mm in the upper eyelid and 3.5 to 4.0 mm in the lower. Medially and laterally they taper to 2 mm in height as they pass into the canthal tendons. As these tarsal plates approach the canthal tendons, they broaden slightly toward the margin and narrow toward the proximal surface, thus assuming a more triangular cross-section. Within each tarsus are the Meibomian glands, approximately 25 in the upper lid and 20 in the lower lid. These are holocrine-secreting sebaceous glands not associated with lash follicles. Each gland is multilobulated and empties into a central ductule that opens onto the posterior eyelid margin behind the gray line. They produce the lipid layer of the precorneal tear film. Medially the tarsal plates pass into fibrous bands that form the crura of the medial canthal tendon. These lie between the orbicularis muscle anteriorly and the conjunctiva posteriorly. The superior and inferior crura fuse to form a stout common tendon that inserts via three limbs (Fig. 7) (2). The anterior limb inserts onto the orbital process of the maxillary bone in front of and above the anterior lacrimal crest. It provides the major support for the medial canthal angle. The posterior limb arises from the common tendon near the junction of the superior and inferior crura, and passes between the canaliculi. 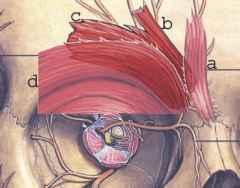 It inserts onto the posterior lacrimal crest just in front of Horner's muscle. The posterior limb directs the vector forces of the canthal angle backward to maintain close approximation with the globe. The superior limb of the medial canthal tendon arises as a broad arc of fibers from both the anterior and posterior limbs. It passes upward to insert onto the orbital process of the frontal bone. The posterior head of the preseptal orbicularis muscle inserts onto this limb and the unit forms the soft-tissue roof of the lacrimal sac fossa. This tendinous extension may function to provide vertical support to the canthal angle (15), but also appears to play a significant role in the lacrimal pump mechanism. Laterally the tarsal plates pass into fibrous strands that become the crura of the lateral can-thal tendon. The lateral canthal tendon is a distinct entity separate from the orbicularis muscle. It measure about 1 mm in thickness, 3 mm in width, and approximately 5 to 7 mm in length (16). Insertion of these fibers extends posteriorly along the lateral orbital wall where it blends with strands of the lateral check ligament from the sheath of the lateral rectus muscle. The conjunctiva is a mucous membrane that covers the posterior surface of the eyelids and the anterior surface of the globe except for the cornea. The palpebral portion is closely applied to the posterior surface of the tarsal plate and the sympathetic tarsal muscle of Müller. It is continuous around the fornices above and below where it joins the bulbar conjunctiva. Small accessory lacrimal glands are located within the submucosal connective tissue. At the medial canthal angle is a small mound of tissue called the caruncle. This consists of modified skin containing hairs, sebaceous glands, and sweat glands. Just lateral to the caruncle there is a vertical fold of conjunctiva, the plica semilunaris. The submucosa of this tissue contains adipose cells and smooth muscle fibers resembling the nictitating membrane of lower vertebrates. This likely represents a vestigial structure that has been modified to allow enough horizontal slack at the shallow medial fornix for rotation of the globe. The motor nerves to the orbicularis muscle derive from the facial nerve (N. VII) through its temporal and zygomatic branches (Fig. 8). The facial nerve divides into two divisions, an upper temporofacial division and a lower cervicofacial division (17). The upper division further subdivides into the temporal and zygomatic branches that innervate the frontalis and orbicularis muscles. The lower cervicofacial division gives rise to the buccal, mandibular, and cervical branches innervating muscles of the lower face and neck. There can be considerable variation in the branching pattern of these nerves, and in some individuals extensive anastomoses interconnect all these peripheral branches. The sensory nerves to the eyelids derive from the ophthalmic and maxillary divisions of the trigeminal nerve. Sensory input from the upper lid passes to the ophthalmic division through its main terminal branches, the supraorbital, supratrochlear, and lacrimal nerves. The infratrochlear nerve receives sensory information from the extreme medial portion of both upper and lower eyelids. The zygomaticotemporal branch of the lacrimal nerve innervates the lateral portion of the upper eyelid and temple. These branches also innervate portions of the adjacent brow, forehead, and nasal bridge. The lower eyelid sends sensory impulses to the maxillary division via the infraorbital nerve. The zygomaticofacial branch from the lacrimal nerve innervates the lateral portion of the lower lid and part of the infratrochlear branch receives input from the medial lower lid. Figure 8 Motor branches of the seventh cranial nerve to the eyelid and brow muscles. a. Frontal branch; b. zygomatic branch; c. buccal branch. Vascular supply to the eyelids is extensive. 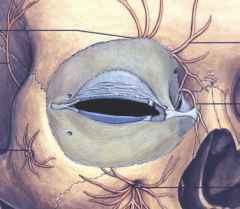 The posterior eyelid lamellae receive blood through the palpebral arterial arcades (Fig. 9). In the upper eyelid a marginal arcade runs about 2 mm from the eyelid margin and a peripheral arcade extends along the upper border of tarsus between the levator aponeurosis and Müller's muscle. These vessels are supplied medially by the superior medial palpebral vessels from the terminal ophthalmic artery, and laterally by the superior lateral palpebral vessel from the lacrimal artery. 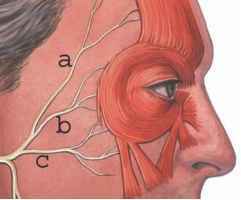 The lower lid arcade receives blood from the medial and lateral inferior palpebral vessels. Figure 9 Arterial supply to the eyelids. a. Medial palpebral artery; b. lateral palpebral artery; c. superior peripheral arcade; d. superior marginal arcade; e. inferior marginal arcade; f. angular artery. Figure 10 Venous supply from the eyelids. a. 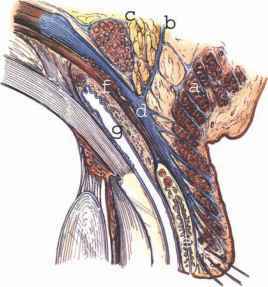 Superior venous arcade; b. inferior venous arcade; c. transverse facial vein; d. superior palpebral vein. The venous drainage system is somewhat less well defined than the arterial system. Drainage is primarily into several large vessels of the facial system (Fig. 10). Lymphatic drainage from the eyelids is restricted to the region anterior to the orbital septum. Drainage from the lateral two-thirds of the upper eyelid and the lateral one-third of the lower eyelid is inferior and lateral into the deep and superficial parotid and submandibular nodes. Drainage from the medial one-third of the upper eyelid and the medial two-thirds of the lower eyelid is medially and inferiorly into the anterior cervical nodes. Extensive excision of subcutaneous eyelid tissues or deep incisions in the inferolateral eyelid or in the deep fornix area can result in lymphedema due to disruption of these vessels. The eyebrows lie at the junction between the upper eyelid and the forehead. They consist of thickened skin overlying the supraorbital torus and support short, course hairs that emerge from the skin surface at an oblique angle. The complex movements of the brows is provided by the interdigitation of five striated muscles which insert partially along the brow: the frontalis, procerus, depressior supercilii, corrugator, and orbicularis muscles (Fig. 11). All are innervated by the seventh cranial nerve. The frontalis muscle fibers are oriented vertically on the forehead. They begin superiorly at about the level of the coronal suture line and extend toward the supraorbital rim. The galea aponeurotica splits into a thin superficial portion overlying the frontalis muscle, and a deep thicker layer that extends beneath the muscle to insert onto the supraorbital rim at the arcus marginalis. Beneath the muscle a deep fat layer separates the frontalis muscle from the underlying deep fascia along the orbital rim. This sub-brow fat pad may continue into the upper eyelid where is can be confused with the preaponeurotic fat pockets. It is responsible for the thick full upper lids seen in some patients. Figure 11 Muscles of the brow. a. Procerus muscle; b. depressor supercilii muscle; c. corrugator muscle; d. orbicularis muscle. end of the frontal bone at the superomedial orbital rim and passes obliquely, superiorly, and laterally where it inserts into the deep fascia of the frontalis muscle along the medial one-third of the brow by two heads, the oblique and the transverse heads. 1. Hrecko T, Farkas LG, Katic M. Clinical significance of age-related changes in the palpebral fissure between ages 2 and 18 in healthy Caucasians. Acta Chir Plast 1968; 32:194-204. 2. Dutton JJ. 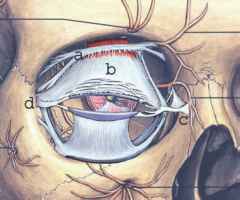 Atlas of Clinical and Surgical Orbital Anatomy. Philadelphia: W.B. Saunders, 1994. 3. Ahl NC, Hill JC. Horner's muscle and the lacrimal system. Arch Ophthalmol 1982; 100:488-493. 4. Barker DE. Dye injection studies of orbital fat compartments. Plast Reconstr Surg 1977; 59:82-85. 5. Putterman AM, Urist MJ. Surgical anatomy of the orbital septum. Ann Ophthalmol 1974; 6:290-294. 6. Anderson RL, Dixon RS. The role of Whitnall's ligament in ptosis surgery. Arch Ophthalmol 1979; 97:705-707. 7. Harvey JT, Anderson RL. The aponeurotic approach to eyelid retraction. Ophthalmology 1981; 88:513-524. 8. Meyer DR, Linberg JV, Wobig JL, McCormick S. Anatomy of the orbital septum and associated eyelid connective tissue. Ophthal Plast Reconstr Surg 1991; 7:104-113. 9. Lemke BN, Stasior OG, Rosenberg PN. The surgical relations of the levator palpebrae superioris muscle. Ophthal Plast Reconstr Surg 1988; 4:25-30. 10. Anderson RL, Beard C. The levator aponeurosis. Attachments and their clinical significance. Arch Ophthalmol 1977; 95:1437-1441. 11. Collin JRO, Beard C, Wood I. Experimental and clinical data on the insertion of the levator palpebrae superioris muscle. Am J Ophthalmol 1978; 85:792-801. 12. Manson PN, Lazarus RB, Morgan R, Iliff N. Pathways of sympathetic innervation to the superior and inferior (Müllers) tarsal muscles. Plast Reconstr Surg 1986; 78:33-40. 13. Kuwabara T, Cogan DG, Johnson CC. Structure of the muscles of the upper eyelid. Arch Ophthalmol 1975; 93:1189-1197. 14. Hawes MJ, Dortzbach RK. The microscopic anatomy of the lower eyelid retractors. Arch Ophthalmol 1982; 100:1313-1318. 15. Anderson RL. The medial canthal tendon branches out. Arch Ophthalmol 1977; 95:2951-2952. 16. Gioia VM, Linberg JV, McCormick SA. The anatomy of the lateral canthal tendon. Arch Ophthalmol 1987; 105:529-532. 17. Malone B, Maisel RH. Anatomy of the facial nerve. Am J Otolaryngol 1988; 9:494-504. Which stratum is absent in eyelids? Which stratum is generally absent in the eyelids? What stratum layer is absent in the eyelids? Which stratum of epidermis is absent in eyelid? What stratum is the eyelid lacking?